I’m sure there’s many chili recipes out there claiming that theirs is the best. But this no bean instant pot chili with sausage truly goes above and beyond in flavor. 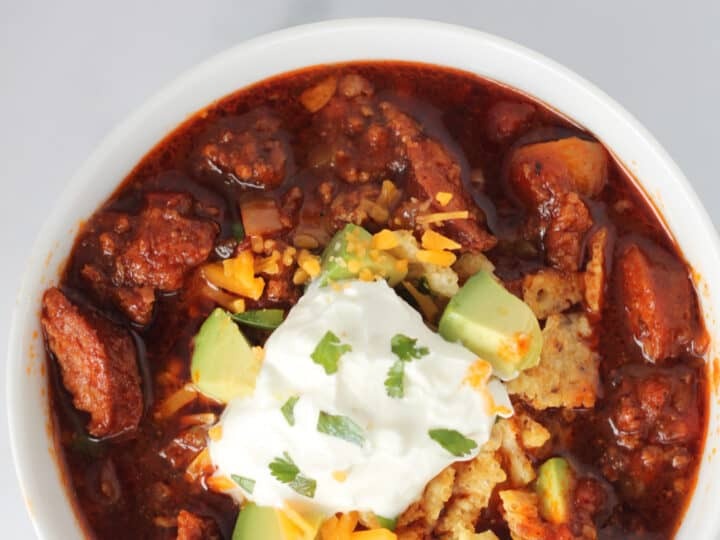 What’s even better is this hearty low carb keto chili is also gluten free, sugar free, and dairy free (if you skip the optional dairy garnishes). To make it paleo chili you can substitute the olive oil for coconut oil and make sure your canned tomatoes do not have added sugar. 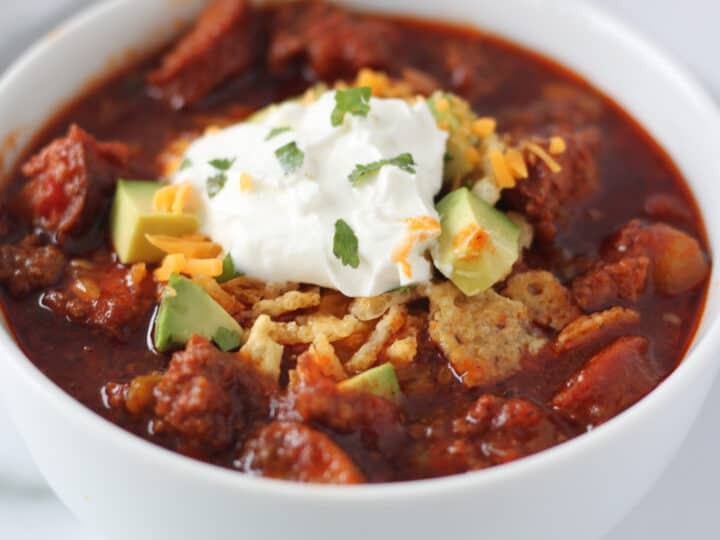 Once you realize other instant pot chili recipes are all missing a key ingredient you didn’t even know should be in chili, you’ll never go back to basic chili again. The secret ingredient in this recipe, my friends, is the kielbasa sausage. Just having chili with ground beef or even ground turkey just cannot compared when you add in a little kielbasa. Trust me, it’s mind blowing! 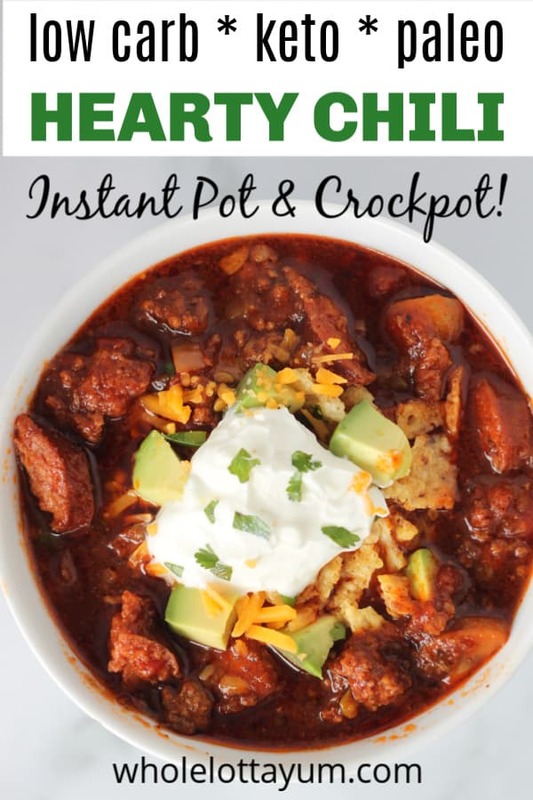 You of course don’t need instant pot brand to make this hearty meal, making pressure cooker chili in whatever brand you have works just the same. 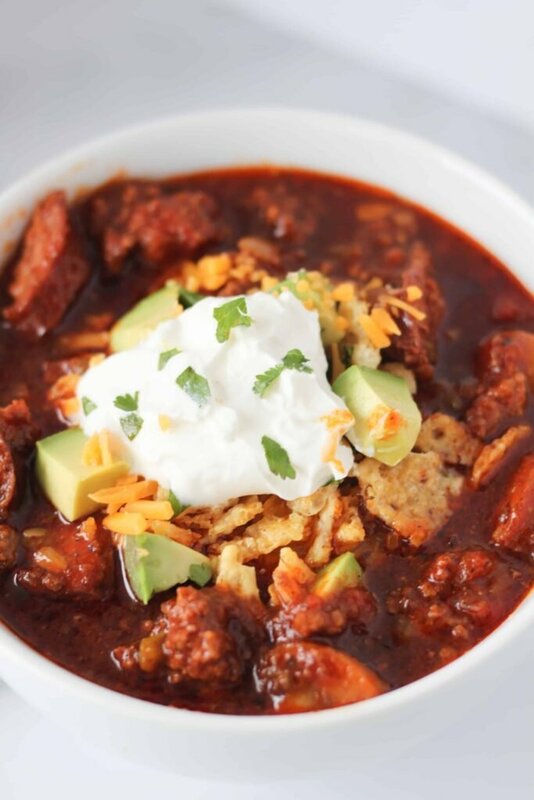 While this specific recipe was made in an instant pot/pressure cooker, being that this is our family favorite chili recipe, we also include instructions for the stove top and a crockpot version. If you’ve never had no bean chili before, you’re in for quite a surprise. By substituting quartered mushrooms in place of the usual can of kidney beans, I promise you won’t even miss the beans. 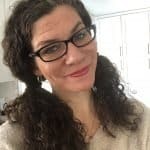 You of course can easily replace the pound of mushrooms for one can of drained and rinsed kidney beans if y0u aren’t trying to make a paleo, keto, or low carb chili recipe. Either way is just fab. Turn your Instant Pot was to sauté high, add 1 T olive oil and cook the ground beef and kielbasa until the ground beef is cooked through. With the stovetop version, I admit I cook the kielbasa separately, but one of the main advantages to an instant Pot is the ease of use and basically being able to dump and cook the ingredients under pressure—so you don’t have to cook chili with numerous different steps. This is why we added the kielbasa when we cooked the ground beef, so you’d get as much of that delicious sautéed meaty flavor infused with the remaining ingredients. 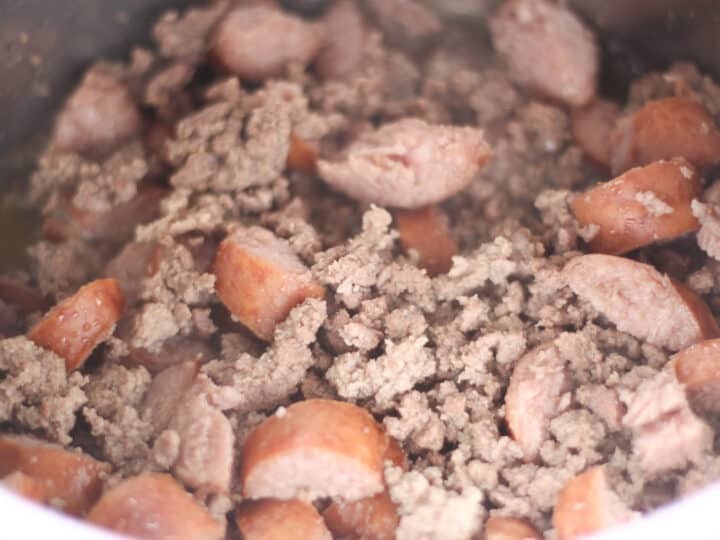 The kielbasa is my family’s favorite part of this chili recipe, BUT you CAN skip it and just add an extra pound of ground meat like ground beef or you could mix in ground turkey or chicken. Our ground beef was a 85/15 lean beef to fat ratio. The rule of thumb with ground beef is the lower the fat the less liquid will be created and the less fat there will be in the recipe, but you also lose a little flavor. Our go to ground beef mixture is almost always an 85/15 or 80/20 lean meat to fat ratio. This mixture does create a little liquid in your pot, but NO need to drain it out. You need some liquid in your pot to help if come under pressure and instead of adding chicken broth (and then having to thicken the chili later like many recipes have you do), no need if you just skip the draining and keep the extra liquid flavor and grease in the pot. IF you get the Instant Pot burn signal, THEN you’ll want to do a quick release of pressure, stir the chili to make sure nothing actual is burning and proceed. If your chili is starting to burn slightly on the bottom, just add 1/2 cup of chicken broth and then proceed with the recipe. 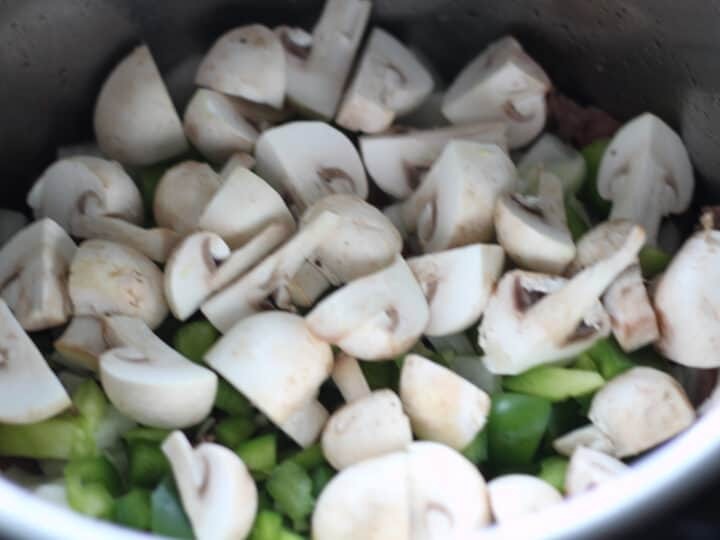 Next, add your diced green pepper, sweet onion and quartered mushrooms. Mushrooms make the perfect stand-in in low carb chili instead of the high carb beans you’ll find in most chili recipes. My family couldn’t believe how much they loved no bean chili! Mushrooms hold their shape and only have 1 net carbs per 1/2 serving. My favorite way to use mushrooms in recipes is to actually quarter them instead of slicing. Dump the remaining ingredients on top of the vegetables and meat. This includes the diced tomatoes, tomato sauce, bay leaves, salt, pepper, chili powder, oregano, and cayenne pepper. Set your Instant Pot to manual (or it’s called pressure cook for some models) high for 20 minutes. Some instant pot models have a chili/bean setting but since this doesn’t have beans in it, the instant pot low carb chili doesn’t doesn’t need to cook as long as a pressure cooker chili/bean setting would have you cook the low carb instinct pot chili. Once it’s done cooking do a natural release for 10 minutes before doing a quick release. Garnish with goodies such as sour cream, avocado, crushed Parmesan chips, shredded cheese and/or cilantro. 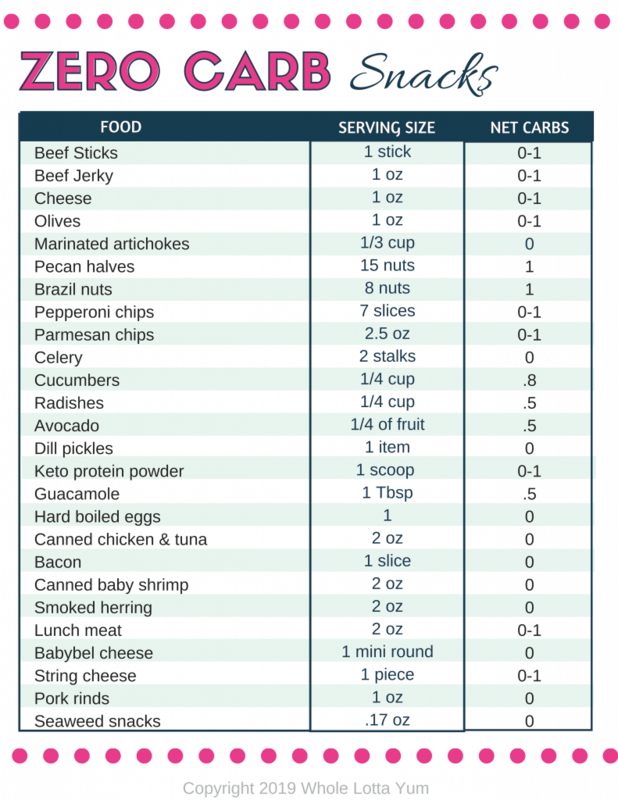 Adding crumbled low carb and keto parmesan crisps is a fantastic substitute for high carb tortilla chips. 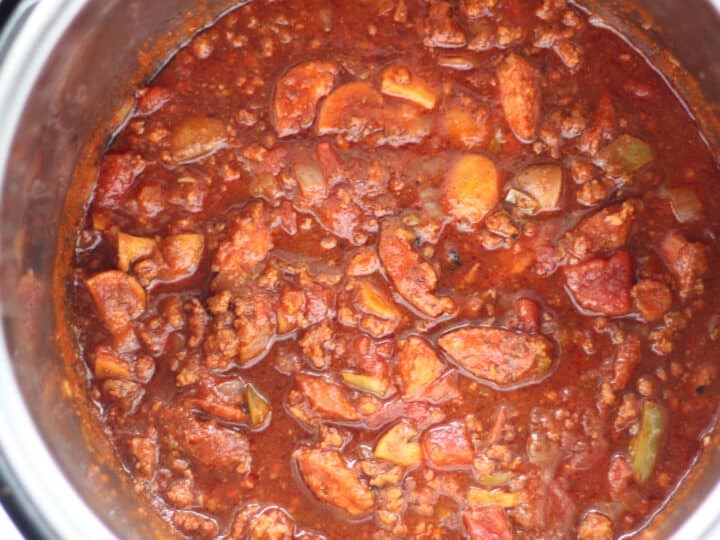 Here’s the instructions for making this a low carb slow cooker chili instead of using a pressure cooker. We also have this recipe on our website as a turkey kielbasa chili in a slow cooker using beans if you’d like to check out the full recipe. To make that slow cooker turkey chili recipe low carb, you just need to substitute the can of beans for 1 lb of quartered white or crimini mushrooms. I will admit I haven’t tried swapping the beans for mushrooms to make this a beanless crockpot recipe, but this is what I would do if I was making this in a slow cooker. Saute the ground beef (or ground turkey) until it’s cooked. Drain the grease. Add the meat to the slow cooker. Cut the kielbasa into 1/2″ slices and then cut each slice again in half. Cook until the sausage is lightly browned, drain the grease and put the sausage into the slow cooker. Add the remaining ingredients and mix gently with a spoon until combined. Cook on low in a crockpot for 8 hours or until done. 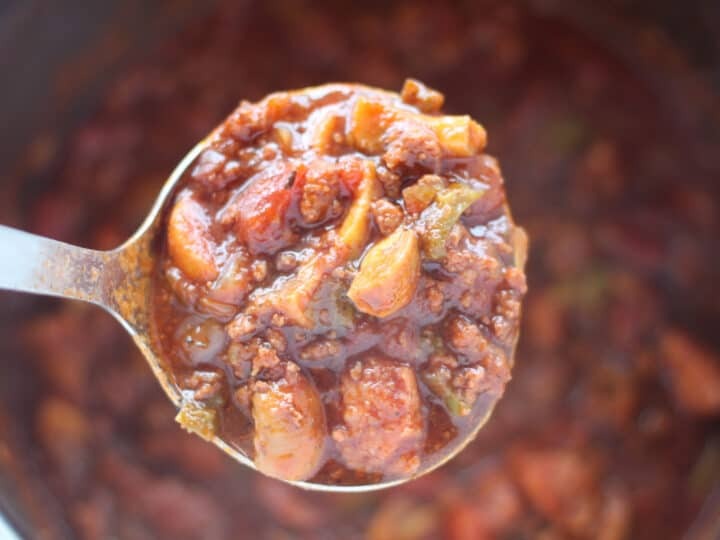 Here’s the adaption for turning this yummy instant pot chili into a low carb keto chili on the stovetop. Again, use mushrooms if you want this to be a low carb, paleo, or keto chili and if you aren’t following a special program it’s perfectly fine to just use 1 14 oz can of kidney beans (drained and rinsed) if you’re looking for more of a traditional chili recipe. Saute the ground beef (or turkey) until cooked through, drain, and set aside. Cut the kielbasa into 1/2″ slices and then cut each slice again in half. Cook until the sausage, onions, and green onion until lightly browned. Add the ground beef and sausage back to the pin along with the remaining ingredients. Stir until combined. Simmer uncovered on low for 1 hour. 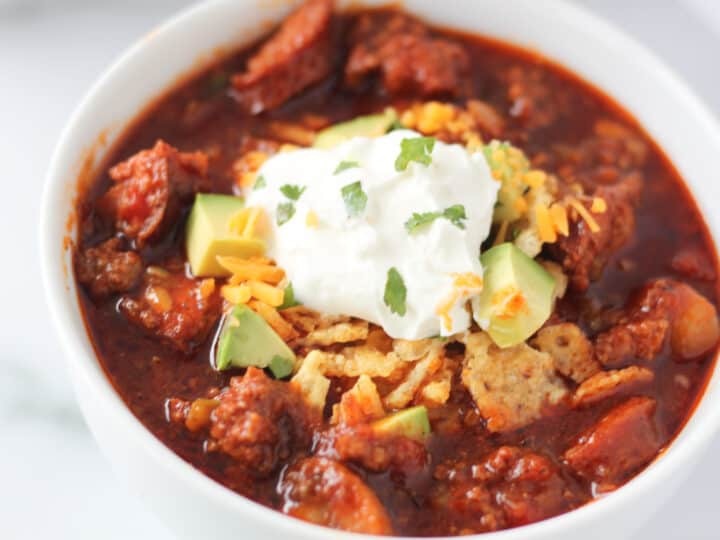 We hope you enjoy this hearty low carb and keto chili whether you’re making instant pot chili, or cooking it on the stove or in your slow cooker. Enjoy! A quick instant pot chili without beans that includes hearty kielbasa sausage and mushrooms. This easy recipe is also low carb, gluten free, paleo, and a keto chili recipe too. Slow cooker and stovetop instructions also included. Turn instant pot to high, add 1 T of olive oil and cook the ground beef kielbasa until the ground beef is cooked through (about 5-6 minutes). 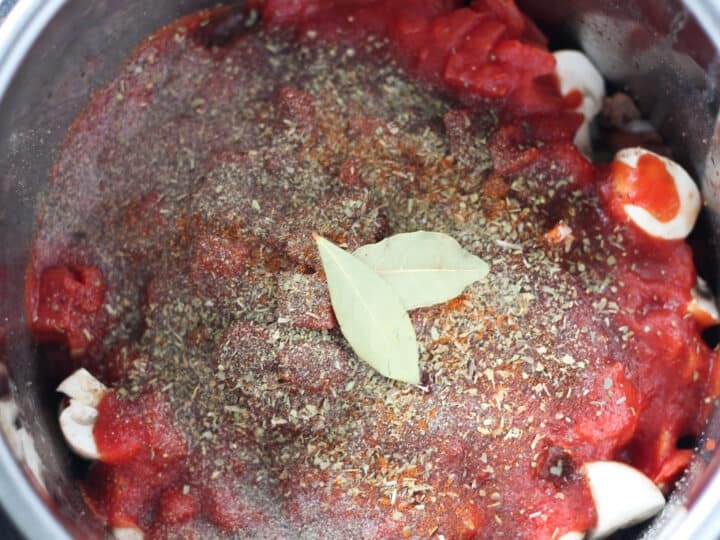 Add the remaining ingredients, which includes the diced green pepper, diced onion, quartered mushrooms, minced garlic, diced tomatoes, tomato sauce, bay leaves, salt, pepper, chili powder, oregano, and cayenne pepper.